Just a few minutes drive to WALT DISNEY WORLD Resort and with restaurants close at hand, the Staybridge Suites at Lake Buena Vista is in a great location. But location is just one of the reasons that holiday makers choose this complex, with the one and two bedroom suites offering a spacious and comfortable retreat from the theme parks. They come well equipped with a kitchen, TV’s in each room and free Wi-Fi. A daily breakfast is included in the price, and three times a week there is a popular “Sundowner Reception” with complimentary appetizers, beer, wine and soft drinks. Top Tip: There are no lifts in the hotel, so if you find stairs difficult, then request a ground floor room. However, if stairs are no problem for you, then the top floor rooms may be a little quieter. A fantastic location, just 5 minutes from Walt Disney World Resort, 10 minutes from SeaWorld Orlando and 20 minutes from Universal Orlando. Two bedroom suite, sleeping up to eight, has a bedroom with one king size bed and bathroom and a bedroom with two double beds and bathroom. Prices correct as at 6pm on 19 Apr 2019. Please call for final price. Prices are per person based on 2 adults & 2 children sharing. Other durations available - call for quote. Prices include flight and accommodation as stated below and car hire including Dollar rent-a-car's 'fully inclusive' insurance package. For more car hire and transfer options please ask your travel expert. For the purposes of the prices above, children are assumed aged 11 and under. Teen prices also available. Daily direct flights available from Gatwick with British Airways. Daily direct flights from Gatwick and Manchester with Virgin Atlantic, plus seasonal departures from Belfast and Glasgow. Summer service with Norweigan Airlines from Gatwick on Tuesday and Saturday. Charter flights with Thomson and Thomas Cook and regional connecting flights also available. Weekend flight supplements appply for Fri/Sat/Sun departures. The Hawthorn Suites is in the heart of Lake Buena Vista, just a couple of miles from Downtown Disney and WALT DISNEY WORLD Resort. 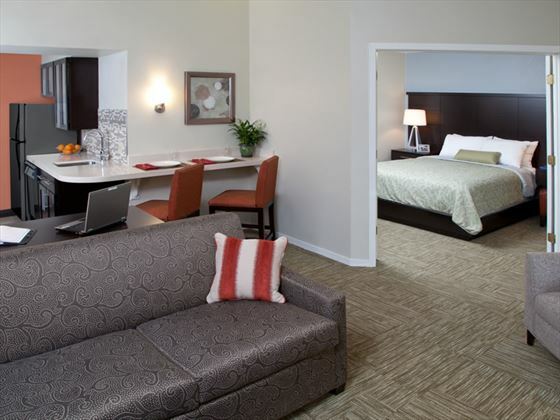 These suites make a comfortable base from which to explore all the theme parks and attractions of Orlando. 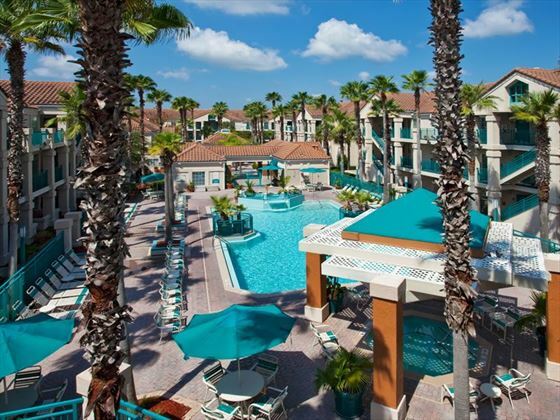 This resort hotel has become a popular choice for holidaymakers, thanks to the fantastic facilities and first rate location next to WALT DISNEY WORLD Resort. The condo style accommodation offers a great degree of comfort and space in which to relax. 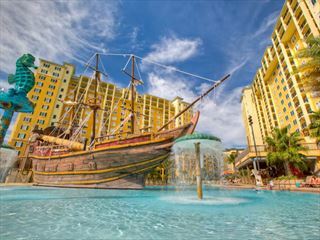 B Resort & Spa is a brand new resort situated in Lake Buena Vista - home to a glistening pool, chic rooms and plenty of style, it's a great resort for the whole family and only minutes from Downtown Disney.